1. He or she is knowledgeable in both languages in order to translate the document. 2. The translation is complete and accurate. In many countries, they need the documents to be translated in the language of their country. The person who wants to produce the documents of one country to another have to translate the documents in the language of that country where he or she wants to use after legalization of the document. 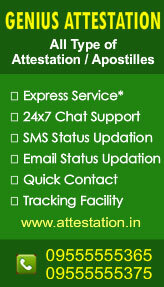 Attestation is a one time process, if you attested once you can use that for the life time, always beware of fake attestations.